On Saturday 3rd of May a group of Israeli Settlers paraded and attacked local Palestinans within the small village of Assira al Qibliya. Assira al Qibliya, is situated in the Nablus governorate in the north of the West Bank and has become used to these regular settler attacks. 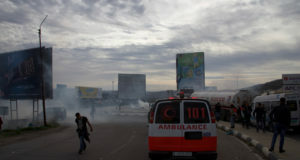 Two Palestinians, one 15 year old and one 40 year old were hospitalised as a result of the attack. 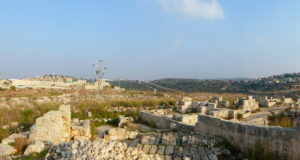 At around 3pm in Assira al Qibliya a group of approximately 30 Israeli settlers, from the Yitzar settlement, became visible in the land close to the village. The settlers intruded on the villagers’ land, throwing stones and even starting a number of large fires within the fields. A Palestinian fire engine soon arrived at the scene, and with a group of about 20 villagers, attempted to extinguish the flames. 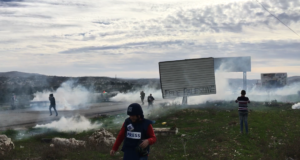 The Israeli army showed their presence when live ammunition, rubber bullets, tear gas and sound bombs were all fired into the field. Witnesses say that shots were fired at the fire engine and that one firefighter was seized and beaten by soldiers before being released. At approximately 3.30pm two villagers were also seized, reportedly by both settlers and soldiers acting together, and beaten with stones and kicked repeatedly. These two residents – one a 15 year old boy and the other a 40 year old man, were then detained for a number of hours, but are now recovering in a Nablus hospital. Soldiers also reportedly fired shots at the water tanks on the roofs of the nearest two houses. Israeli army spokespeople are reported as claiming that the fires were started by the residents and that no settlers entered the village at all – claims which are clearly proven false by the photos of the incidents taken by residents. Photos clearly show settlers starting fires on land owned by residents of the village, reported to be the Jihad and Machmoud Ali families. When speaking to a group of local residents they said that these attacks were all too common in Assira al Qibliya. They expressed a feeling of vulnerability as they told of weekly attacks and encounters with settlers. One woman, Nahla Machmoud, whose water tank was shot by soldiers during the attacks, advised that today three settler men started to come at her while she was alone outside her house. She picked up rocks with which to defend herself, but was too scared, and dropped them before running inside and locking the door. “Today I’m very, very, very tired,” she said. “I’m very scared. My baby – we are very scared. I went into my home and locked my door and my baby is very, very scared and crying.” Nahla advised she is subject constant abuse from settlers who have attacked her home, stolen her water pump, and come in large groups to her home, shouting aggressively so that she was scared to leave. She reported that she has gone to the Israeli police, but that after showing her over 200 photos of settlers, none of whom were from her area, they declined to help any further. She recounts that Israeli police warned her, “If you do anything to the settlers who come to your home, even if you just hit them, we will put you in prison.” When Israeli settlers were beating Palestinians on Saturday, however, hitting them with rocks and kicking them repeatedly, injuring them severely, Israeli soldiers stood by and did nothing.